Jeff Zucker, president of CNN, slammed President Trump during a Jerusalem media conference for his criticism of 'fake news'. 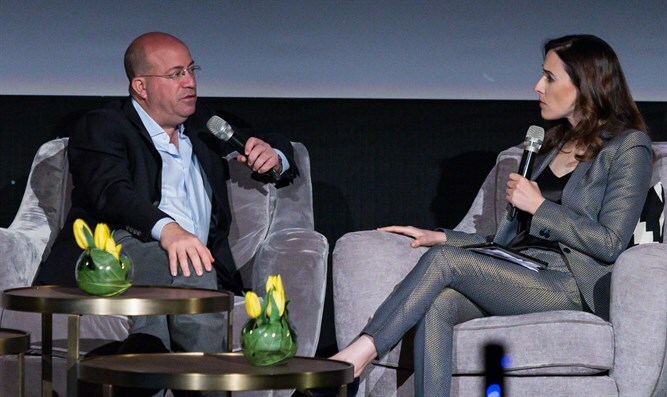 The president of the CNN television network, Jeff Zucker, participated Tuesday morning in a Keshet INTV conference in Jerusalem. In an interview with Yonit Levi, Zucker lashed out at President Trump for his frequent attacks on the media. The CNN chief claimed that this was an "an extraordinary time in journalism, and an incredibly important time,” adding that his network has amassed record ratings and profits since Trump took center stage. Yet Zucker said he is still worried about the effect of the president's relentless attacks on the media. "I always worried about the safety of journalists outside the US. I never thought I would be concerned for their welfare in the US. We should not feel intimidated by this and back off from our professional duty. When we report and maintain our right to report the facts we are not trying to be vindictive, we are merely doing our jobs. Nobody claims that Donald Trump did not win the election fairly. I think he believes that the media is hinting that he did not win legitimately but that is not true. Zucker also described a recent telephone conversation with the president. "It was not a good conversation. That evening I was at home watching CNN and the phone rang, and I said 'hello'. He said 'Jeff, Donald', and I said 'Hi, Donald.' He was upset with a guest we had on CNN and shouted at me for two minutes and then said: 'OK , you got it? Bye' and slammed the phone down. Zucker claimed that Trump's approval ratings are the lowest for an American president until now and stated that he always tries to change the narrative when he does not want to answer a certain question. However he admitted that his claim that Obama had been wiretapping should be investigated and stated that his network would be following the investigation closely.